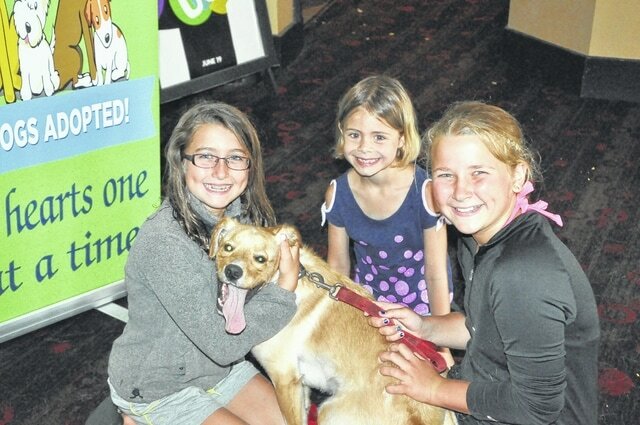 Brenna Heffernan, Lina Karr and Madison Heffernan play with Bernard, a dog visiting from Canine Collective Dog Rescue, at The Strand’s Summer Kids Series Tuesday morning in downtown Delaware. The Strand shows kids’ movies for free during the summer but encourages local families to donate goods or money to a local nonprofit organization. Canine Collective Dog Rescue was the nonprofit in the spotlight Tuesday morning, and families donated money and supplies to the organization.